Jose Mourinho took a thinly-veiled swipe at Arsenal and boss Arsene Wenger after hearing his side subjected to "boring boring Chelsea" chants during their goalless draw at Emirates Stadium. Arsenal's fans vented their frustration as Chelsea took the point which ensured they will win the Premier League title if they beat Leicester City and Crystal Palace in their next two games. The Gunners last won the title in the season of "The Invincibles" when they went 38 league games unbeaten in 2003-2004. 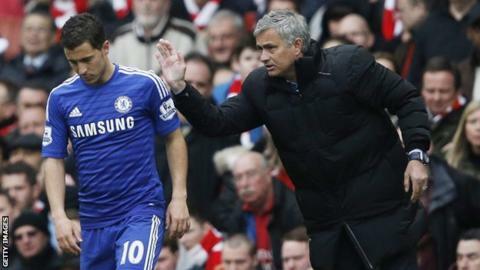 Chelsea manager Mourinho said: "I think boring is 10 years without a title - that's boring. If you support a club and you wait, wait, wait for so many years without a Premier League title, then that's boring. "Maybe Arsenal's fans were not singing to us. When you want to win the game and you take your striker Olivier Giroud off maybe they want more, maybe they want Giroud and Theo Walcott up front." Mourinho's team have scored 65 goals in 33 games and have a goal difference of +39. And the Blues boss added: "This boring team has got the second highest number of goals, has the best goal difference. Only Manchester City have scored more goals than us." Mourinho refused to be drawn into debate about three potential penalties in the first half when Oscar tangled with Hector Bellerin and was then taken out by Arsenal keeper David Ospina before Cesc Fabregas went down under a challenge from Santi Cazorla. He said: "I want to forget the penalties because I think the referee Michael Oliver had a very good performance and also the assistants. They gave a very solid performance so I'm happy with the referee." Mourinho also described John Terry's performance as the best the captain has given in two spells under his management at Chelsea. "I think it was his finest performance in the five seasons we have worked together," said Mourinho. "He had a fantastic performance in my first season, at Highbury, but here everything was clean, reading the game, covering around the game, making interceptions. "The team was phenomenal but John was one step ahead of that." "There's a difference between parking the bus and keeping the ball. It wasn't just clearing the ball and defending from Chelsea, they kept the ball really well. "Chelsea will be delighted with their performance. Arsenal will feel they should have done more. Arsenal did not ask enough questions. "There are a lot of Arsenal fans singing 'boring boring Chelsea'. But go and get the ball off them, show some initiative. I don't know which is more boring to watch." "Jose Mourinho had every right to deliver a punchy response to Arsenal fans taunting him with chants of "boring boring Chelsea." "Chelsea moved a point closer to the title with a performance of iron discipline and superb tactical organisation at Arsenal, where the Gunners have been imperious recently. "There is more than one way to win a title and Chelsea have shown the ability to adapt, playing flowing football, fuelled by the goals of Diego Costa earlier in the season and then digging in without him to beat Manchester United and draw at Arsenal. "The only people Mourinho has to please are Chelsea's fans and owner Roman Abramovich - and it is unlikely they will be bored when they are celebrating another title." Arsenal have won just two of their last 13 league clashes with Chelsea (D3 L8). Chelsea have kept five clean sheets in a row against Arsenal in all competitions. Arsenal have gone eight hours and two minutes without scoring against Chelsea (all competitions). Chelsea have received five bookings for simulation in the Premier League this season, more than any other side. Cesc Fabregas has collected the last two of these. Arsenal recorded one shot on target in their two league fixtures combined against Chelsea this season.